When was the last time you took an opportunity to act like a kid -- not the whiny, temper-tantrum-throwing, irresponsible version of childish behaviour that is totally unattractive in an adult, but the kind where you let yourself loose to enjoy a bunch of silly fun and breathless laughter, free from worry? If it's been awhile, I highly recommend finding a trampoline somewhere outside and jumping on it. 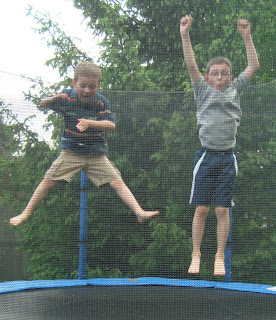 We put a trampoline in our backyard two summers ago (for, um, the children, of course!). I figured since the boys and I spend many of our days in July and August hanging around at home, it would be an exciting and worthwhile piece of backyard equipment to have. I was definitely right; the boys have not grown tired of it yet, and from May to September they can often be seen bouncing, leaping, spinning, and flying amidst shrieks of laughter and shouts of "Hey Mom, watch this!". It's a wonderful way to spend a summer evening, outside with green leaves rustling in a gentle breeze, birds cheerily chirping their late day songs while the sun still shines on the horizon, and children jumping joyfully together on a trampoline, ensuring that they'll sleep well when they do wind down for the night. While I usually leave the trampoline tricks to the boys, every now and then I can't resist the urge to hop up there myself and go wild with them. It's completely exhilarating to take off, to be temporarily suspended in mid-air before bouncing back to earth and then springing gracefully upwards again. Released for a moment from the confining force of gravity, I can perform leaps and turns that I could only have dreamed about when I was a dancer. I am energized by the rush of air whooshing past me and the chance to see a different view of the world. I'm aware that the neighbours can see all of my antics and probably think I've lost my marbles, but in those moments of unencumbered flight with my boys, nothing could matter less. The boys are always completely thrilled when I decide to join them in their jumping. Seeing their faces light up with huge grins when I accept their invitation, and lying in a tumbled, gasping, laughing heap on the trampoline floor with them once we've worn ourselves out, makes me remember what really matters to them. These times of spontaneous fun shared together are the moments that make them happiest, the ones that they'll remember long after their own bouncing-on-trampoline days are gone. Knowing this, I'd have to be crazy NOT to jump with them. The next time you need a break from the pressures of adult life, find a trampoline, some cute, grinning kids, and a perfect summer evening and just jump with all you've got. I can almost guarantee it will fill you with a rush of happiness.